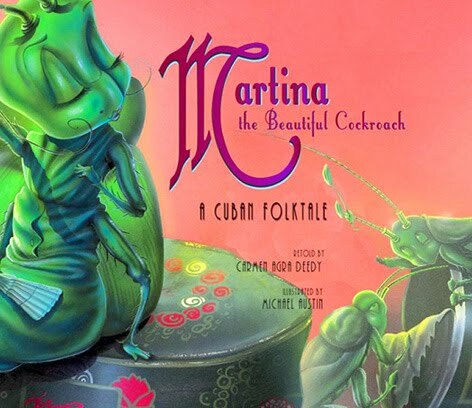 Carmen Agra Deedy delivers a deliciously inventive Cuban version of the beloved Martina folktale, complete with a dash of cafÃ© cubano. Martina the beautiful cockroach doesn t know coffee beans about love and marriage. That s where her Cuban family comes in. While some of the Cucarachas offer her gifts to make her more attractive, only Abuela, her grandmother, gives her something really useful: un consejo increible, some shocking advice. You want me to do what? Martina gasps. At first, Martina is skeptical of her Abuela s unorthodox suggestion, but when suitor after suitor fails The Coffee Test, she wonders if a little green cockroach can ever find true love. Soon, only the gardener PÃ©rez, a tiny brown mouse, is left. But what will happen when Martina offers him cafÃ© Cubano? I love Martina the Beautiful Cockroach. My mommy got it from the library and we kept renewing it because the book was so good. I love how she does the voices for all the characters in the book. It’s a really funny book with great pictures. It’s a good book for any age. I love her name. It’s Martina Josefina Catalina Cucaracha. Finally, I love who Martina chooses to marry, but you’ll have to read the book to find out who. I am ALLLL over this! I'm going to buy this for my niece. Cute! I simply love the cover. The illustration is gorgeous! I LOVED it when you read this to me over the phone Lizzy! It is an adorable tale!! I need to buy it. It's THAT cute!!! Even Uncle Luis likes it!! I just read this one to my students last week, they loved it.